ASP.NET 2.0 introduces a provider model for creating custom Resource Providers that can store localization data in stores other than Resx files. Resx resources are all fine and good but putting data in a more flexible resource store gives you many more options for editing and administering resources interactively and even at runtime. In this article I'll demonstrate how to create a new Resource Provider that stores resource information in a database and show a resource editing tool that makes it much easier to edit resources interactively in the context of your live ASP.NET applications. This article is old, but describes the tooling and architecture of those components. Just make sure if you plan to use these components to grab tham off GitHub as that's the latest version that is supported, contains bug fixes and is current. 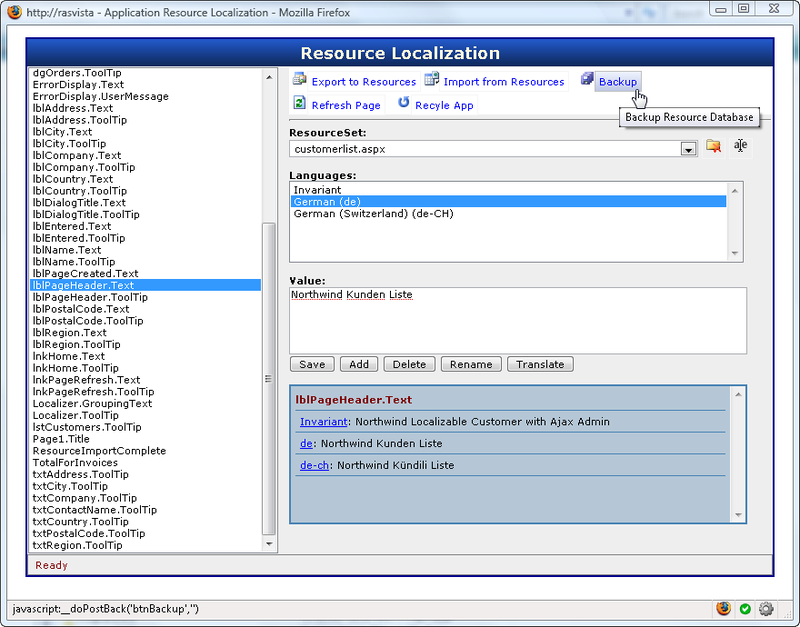 ASP.NET 2.0 has greatly improved the tools and functionality to create localized applications. One of the new key components is the introduction of a provider model for resource localization that makes it possible to use resources from sources other than ..Resx files. In this article I’ll describe how ASP.NET Resource Providers work and how you can create a custom provider. As a practical example I’ll show you how I built a data-driven provider along with a fairly rich ASP.NET front end application that allows editing of resources at runtime in a context sensitive fashion against the live application. This article assumes that you’re somewhat familiar with the new ASP.NET 2.0 localization features. When I started writing I planned to start with a quick overview of features, but it quickly got out of hand and I ended up publishing it as a separate paper. If you’re new to localization in ASP.NET 2.0 I recommend you check out this document as it will give you the background needed to understand how the resource provider actually serves various localization features in ASP.NET 2.0. The default resource storage mechanism in .NET uses Resx based resources. Resx refers to the file extension of XML files that serve as the raw input for resources that are native to .NET. Although XML is the input storage format that you see in Visual Studio and the .Resx files, the final resource format is a binary format (.Resources) that gets compiled into .NET assemblies by the compiler. These compiled resources can be stored either alongside with code in binary assemblies or on their own in resource satellite assemblies whose sole purpose is to provide resources. Typically in .NET the Invariant culture resources are embedded into the base assembly with any other cultures housed in satellite assemblies stored in culture specific sub-directories. If you’re using Visual Studio the resource compilation process is pretty much automatic – when you add a .Resx file to a project VS.NET automatically compiles the resources and embeds them into assemblies and creates the satellite assemblies along with the required directory structure for each of the supported locales. ASP.NET 2.0 expands on this base process by further automating the resource servicing model and automatically compiling Resx resources that are found App_GlobalResources and App_LocalResources and making them available to the application with a Resource Provider that’s specific to ASP.NET. The resource provider makes resource access easier and more consistent from within ASP.NET apps. The .NET framework itself uses .Resx resources to serve localized content so it seems only natural that the tools the framework provides make resource creation tools available to serve this same model. Resx works well enough, but it’s not very flexible when it comes to actually editing resources. The tool support in Visual Studio is really quite inadequate to support localization because VS doesn’t provide an easy way to cross reference resources across multiple locales. And although ASP.NET’s design editor can help with generating resources initially for all controls on a page – via the Generate Local Resources Tool – it only works with data in the default Invariant Culture Resx file. Resx Resources are also static – they are after all compiled into an assembly. If you want to make changes to resources you will need to recompile to see those changes. ASP.NET 2.0 introduces Global and Local Resources which can be stored on the server and can be updated dynamically – the ASP.NET compiler can actually compile them at runtime. However, if you use a precompiled Web deployment model the resources still end up being static and cannot be changed at runtime. So once you’re done with compilation the resources are fixed. Changing resources at runtime may not seem like a big deal, but it can be quite handy during the resource localization process. Wouldn’t it be nice if you could edit resources at runtime, make a change and then actually see that change in the UI immediately? This brings me to storing resources in a database. Databases are by nature more dynamic and you can make changes to data in a database without having to recompile an application. In addition, database data is more easily shared among multiple developers and localizers so it’s easier to make changes to resources in a team environment. When you think about resource editing it’s basically a data entry task – you need to look up individual resource values, see all the different language variations and then add and edit the values for each of the different locales. While all of this could be done with the XML in the Resx files directly it’s actually much easier to build a front end to a database than XML files scattered all over the place. A database also gives you much more flexibility to display the resource data in different views and makes it easy to do things like batch updates and renames of keys and values. The good news is that the resource schemes in .NET are not fixed and you can extend them. .NET and ASP.NET 2.0 allow you create custom resource managers (core .NET runtime) and resource providers (ASP.NET 2.0) to serve resources from anywhere including out of a database. The focus of this article is a custom Resource Provider implementation called DbResourceProvider and a rich ASP.NET based Admin interface for editing resources. The resource provider uses a database - or rather a single table in any database – to hold the resources for an entire site so it can be added easily to existing application databases. To give you an idea of the flexibility that a data driven provider offers let me start off by showing an example of the resource editor in action. The resource editor uses the same data that the resource provider consumes and the editor provides a runtime user interface for adding and editing for resources. I was working on a project some months ago where the customer needed to be able to edit their localization data interactively, preferably through the ASP.NET application interface. So I set to work and started building the DbResourceProvider which allows storing of resources in a Sql Server database table. The table mimics the information that is stored in a Resx and the data is exposed through my custom DbResourceProvider provider for ASP.NET. The idea is that if the data can be stored in a database it can then be edited in real time as part of the ASP.NET application. The resulting Localization Administration form is shown in Figure 1. 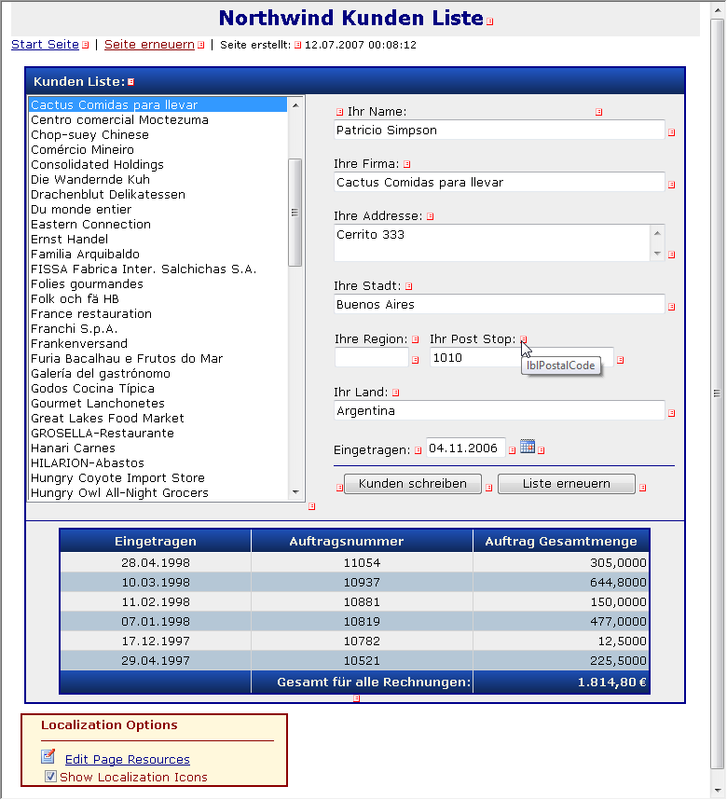 The form sports a number of useful features like the ability to see all the resource entries across various cultures for given resource key (in the blue box), clicking on the culture to immediately edit the value, easy adding of new keys and values for a culture, adding of new resource sets, and even a basic translation feature using Google Translate and Babelfish as shown in Figure 2. The interface uses AJAX with a client centric service interface so that most of the requests are quick as you scroll through the resource list and make changes. Most options occur in popup windows like Figure 2 so you are always staying in the current page context. The user interface is mostly client centric and uses very few Postbacks. To facilitate the process of getting resources into the database, you can import resources from Resx files in App_GlobalResources and App_LocalResources. There’s also a DesignTimeResourceProvider so that ‘Generate Local Resources’ from within Visual Studio works once the provider is hooked up. Finally you can export the database resources back out into App_GlobalResources and App_LocalResources in case you prefer to run your applications with Resx resources after localization in the database is complete. That’s optional though – it’s perfectly possible to deploy and run an application with the DbResourceProvider and without supplying any Resx resources at all serving the resource data only from the database. One thing to keep in mind is that when you’re starting out with a database provider you have to make sure that the database is available. No database, no resources which can be problematic. This also means that if you have an existing Resx localized site you have to make sure you first import your resources or else your site will be broken with no resource data served. In this respect database resources are more fickle than Resx, but then again if your database isn’t working properly the rest of your app is probably dead in the water anyway <s>. Another important feature is the ability to do context sensitive resource editing. I like the ability to look at a page and see all (well most of them anyway) of the controls that are localizable on it, then be able to click on an icon and have that take me directly to the appropriate item in the Localization Admin form. To make this happen I created a custom control (DbResourceControl) which can be dropped onto any ASP.NET form that accomplishes this task. It’s shown in Figure 3. Figure 3 – The DbResourceControl can be dropped onto any ASP.NET form to provide context sensitive links to Resource Administration form to show the appropriate resources if they exist. When enabled the control runs through all the controls on the page and checks for any localizable properties. If there are any it dynamically adds an icon image next to the control. Clicking the icon launches the Resource Administration form and passes the control id as a parameter. The admin form then tries to find a matching resource for this control if it exists. It may not always find an exact match, since there can be multiple localizable properties on a control, and resource naming may vary, but it should get you close in the list. The search pattern looks for the name of the control or the name plus the control plus Resource as generated by Generate Local Resources for matches. The control is smart enough to detect user controls and master page content and send you to the appropriate ResourceSet for these controls rather than the Page. The DbResourceControl can be dropped on any ASP.NET form, but it’s really useful only if you drop it onto a form that has resources associated with it already. The control can be globally enabled or disabled as part of the resource provider configuration. One of the provider properties determines whether the control should be shown and if the option is set to false the control simply won’t render anywhere in the application. This makes it easy to turn resource administration on during development and testing and turn it off when the site goes live. DbResourceProvider and all of the support services are implemented in a single self contained Westwind.Globalization.dll assembly that you can deploy with your application. However, the Administration interface requires a couple of additional items: You have to deploy the Adminstration UI as a folder underneath your Web application. This folder contains the administration form, style sheet and resources (for English and German). You can simply copy the LocalizationAdmin folder from the sample project into your Web App’s root directory application. In addition the Westwind.Web.Controls.dll assembly is required to provide Ajax callbacks and a few support controls. The key property here is the ConnectionString, which can either be a full ConnectionString to a database or as above to a ConnectionStrings entry in the .config file. resourceTableName lets you specify a table name of where resources are stored. Note that you can add resources to any database of your choice - the provider only requires one table. If the table doesn’t exist when you bring up the resource form you’ll be prompted to create the table. When you run the app for the first time, make sure you use a Sql account for the connection that has rights to create a table in the specified database (this is also useful for the Backup feature which creates a _Backup table copy). The other important property is the localizationFormWebPath which needs to point at the resource administration form, wherever you copied it inside of your application. This link is used on the icon links that pop up next to controls to provide context sensitive resource lookup. The designTimeVirtual path should map the name of your ASP.NET project – this is used to let the designTime provider find web.config and the configuration information of the provider at design time. If you hook up the provider settings above you are configuring the resource provider’s operation and the operation of the admin form, but the provider is not actually hooked up yet. The last step is to actually enable the ResourceProvider so ASP.NET can use it. Important! Create the Database and import Resources First! But before you hook up the provider you should first import all resources into the database. This is done for you with the samples provided, but is absolutely required with any new projects you start up with. Otherwise there will be no resources and any forms that rely on resources including the admin form will come up looking awfully void of static content. Not good. Figure 4 – Before hooking up the DbResourceProvider as a ResourceProvider in web.config make sure you create the resource table and import existing resources – this is required for the admin form to work but also to get you started with any existing resources you might have. At that point the database provider should contain the same resources your app used from .Resx before if any. At the very least the Admin form’s resources were imported. It also ensures that the provider is working properly, that your database connection is alright etc. Basically if the admin form works the provider will work as well since both share the same configuration settings from web.config. You can now continue to work with the Administration form and make changes even though you are still using the Resx provider. However, you will not be able to see the changes you made to the resources in your actual Web UI until you hook up the provider. ASP.NET expects a resource provider factory and here I’m specifying one of the two resource providers that are part of the DbResourceProvider library. The full DbResourceProvider uses a .NET ResourceManager implementation behind the scenes while the DbSimpleResourceProvider uses only the ASP.NET required interfaces. The simple version is slightly more efficient as it doesn’t make pass through calls to the underlying resource manager so there’s really no need to use the full provider. It’s mainly there to test the ResourceManager’s operation that can also be used in WinForms apps. After you’ve made changes to the resources you might actually like to see the new resources show up in the live user interface. Notice n Figure 1 that there’s a Recyle App button in the menu. ASP.NET’s resource provider loads resources and the resources are forever cached until the application shuts down. As far as I know there’s no built-in way to release the resources, but the data provider here includes some logic for tracking each provider instance loaded and unloading the resources which is quite nice as you can see changes made in real time. you are actually talking to the ASP.NET Resource Provider implementation. ASP.NET then builds on top of these very basic features with compiler enhancements like Explicit Resource and Implicit Resource expressions that allow you to bind control properties to resource keys easily. The ASP.NET compiler basically generates code with calls to the above methods (see intro article for details). Traditional .NET applications use a ResourceManager that deals with serving resources, but ASP.NET uses the provider model to provide a somewhat simpler extension interface – it’s quite a bit easier to build a resource provider than a full resource manager. The default ASP.NET Resource Provider however calls the standard .NET ResourceManager object to serve Resx resources. So when it comes to creating a custom Resource Provider or Resource Manager you have a choice to make: Do you want it to work exclusively with ASP.NET in which case you can implement only a Resource Provider, or do you need it also to work with WinForms or other types of projects? In that case you will need to implement a ResourceManager as well. I’ve provided to versions of a ResourceProvider and a ResourceManager both accessing the same backend data storage. Figure 5 shows the base implementation of the DbSimpleDataProvider which demonstrates the class structures for a basic resource provider. Figure 5 – A basic ResourceProvider Implementation must implement 3 classes and several interfaces, but it’s fairly straight forward. Most of the code is boilerplate with only a couple of points where data retrieval is required. The ResourceProviderFactory is a very simple class that simply returns a Resource Provider instance. The Resource Provider is where all the action is and it requires implementation of the IResourceProvider and IImplicitResourceProvider interfaces. The ResourceProvider manages all the resource sets and provides data to ASP.NET when it calls into the provider. Finally ResourceReader is used to actually read through the resource sets by iteration. The ResourceReader is little more than specialty IDictionaryEnumerator implementation that can quickly traverse a given ResourceSet. It’s used internally to serve the resource data as well as exposed externally for ASP.NET to access the resource data in the required public ResourceSet property of the provider. The key methods on the ResourceProvider are GetObject() which is what HttpContext.GetGlobalResourceObject/GetLocalResourceObject call into, and GetImplicitResourceKeys() which is called by ASP.NET during compilation to retrieve all resource keys for a given control name as provided by the meta:ResourceKey attributes. The compiler then generates code for the this.GetLocalResourceObject() calls in Page initialization for these implicit keys. How does the ResourceProvider work? A ResourceProvider is a hosting container for a set of resources. A resource set is made up of all the resources for all cultures for specific group of resources say a single resource file or a single page for local resources. To put this in perspective with Resx files, all files with the same base filename make up one resource set: Resources.resx, Resources.de.resx, Resources.fr.resx etc. The ResourceProvider presents these resources in nested IDictionary structures which are exposed through a ResourceReader. The Dictionaries are nested which is a little confusing at first: The top level dictionary holds another set of dictionaries one for each of the cultures implemented for the given ResourceSet. Each one of IDictionary entries then in turn contains a dictionary of the actual resources keys and values pairs that make up the actual resource data. When ASP.NET receives a call to HttpContext.GetGlobalResourceObject or HttpContext.GetLocalResourceObject, it creates a new provider for each individual resource set requested and holds on to it internally. Internally ASP.NET manages the ResourceSets by resource name for local resources (ie. some normalized form of ~/admin/default.aspx) or by global resource filename (ie. MyResources). Both of the HttpContext method calls provide these ‘ResourceSet keys’ as parameters and so ASP.NET picks the appropriate provider and calls GetObject() on it to retrieve the actual resource value. 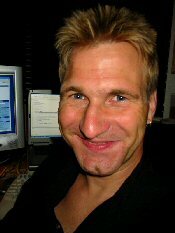 The provider then uses its internal ResourceReader to retrieve the value and return it ASP.NET. Keep in mind that ASP.NET actually instantiates MANY resource provider objects – one for each page’s local resources (each page and control) and one for each set of global resources. You ever wonder why you can’t a reference to ‘the’ resource provider in ASP.NET? The reason is there’s no single resource provider, but many anonymous resource providers that ASP.NET internally tracks and doesn’t expose to the ASP.NET application. You can implement the provider any way you like, but the recommended approach is to load up these resource dictionaries as they are requested and then cache them in memory. The default implementations in .NET use Hashtables and Dictionary<string,object> and I followed those same conventions in my data driven provider. The caching dictionary mechanism is fast and works well. In fact it’s surprising how little performance overhead difference there is between localized and non-localized forms! But resource caching also has the downside that you can never effectively unload the resources. The assumption is that resources are static and therefore don’t need to be refreshed and so ASP.NET doesn’t provide a mechanism for unloading them. Nevertheless this can be a useful feature if you’re using a dynamic resource provider that allows editing for resources. To work around this important issue the DbResourceProvider adds a ClearResourceCache() method to each provider and a	static list object that adds each provider as it's loaded. This makes it possible to unload resources by simply iterating over the list and calling ClearResourceCache. This beats the raw ASP.NET alternative which is to force the AppDomain to unload with HttpRuntime.UnloadAppDomain() or by touching web.config that I've used previously. With the custom provider you can call the static DbResourceConfiguration.ClearResourceCache() from anywhere to force a reload of all resources from the database. What follows is a discussion of a simple resource provider implementation. The key methods of the a ResourceProvider are GetObject() and GetImplicitResourceKeys() which are the only methods that ASP.NET calls to actually retrieve actual resource data. Listing 1 shows the full provider implementation to give you an idea how the resource retrieval and caching works. /// passes a 'classname' which is the ResourceSet id or how a resource is identified. /// our ResourceSet id. ie. Resource.resx becomes "Resources"
/// (subdir/test.aspx) by stripping off the base path. /// talks directly to the data resoure business layer (DbResourceDataManager). /// and instead use custom data access code of your choice. /// which is the ResourceSetId in the database. /// loaded we just cache the resources. /// code is manually called. /// Resource collection if they exist when a request for "control"
/// is made as the key prefix. return keys; // Cannot return null! /// Returns an Implicit key value from the ResourceSet. /// determines which keys are actually retrievable. /// the value using standard GetObject logic for the ResourceID. /// is passed in the constructor. Although there’s a fair bit of code in Listing 2, the DbResourceProvider code is almost completely boiler plate: To create a new provider of your own you can simply use all of the above code, change the class names and hook up your data retrieval mechanism in the two places highlighted in the code with DEPENDENCY HERE. All other code is fully self contained. The GetObjectInternal method does most of the work for simple resource retrieval and it works by retrieving resources through the ResourceCache. Notice LoadResourceCache basically loads the data from the database exactly once and after that simply caches the data in the in memory IDictionary structure. I’ll come back to the DbResourceDataManager and what it does, but for now just know that it simply returns a Dictionary<string,object> which is populated from the database. GetObjectInternal() then simply asks for a specific resource key and tries to return it. The GetImplicitResourceKeys() method provides ASP.NET with a list of all matching keys for a given property. ASP.NET bascially passes the value of a meta:ResourceKey expression as a parameter and expects the method to return a collection ImplicitResourceKey objects that match the prefix. So ASP.NET will ask for lblNameResource1 and expects to get back lblNameResource1.Text and lblNameResource1.ToolTip for example where each key is returned as an ImplicitResourceKey object that breaks out the KeyPrefix and Property separately. Based on the returned data ASP.NET then embeds calls to this.GetLocalResourceObject() into the Page tree, which in turn cause GetObject() calls against the provider at runtime. Implicit keys are requested at compile time, not runtime! This means the resource keys must be available at compile time. Compile time can mean dynamic compilation on your live site when you deploy or – if you are precompiling your site locally – compilation on your local machine. In either case you need to make sure that the resource provider is available at compile time or the implicit resources will not be generated into the page. The compiler will not let you know that the implicit resources are missing – you’ll just get blank values. There’s a little more to it! I cheated a bit in Figure 5 to keep things simple. 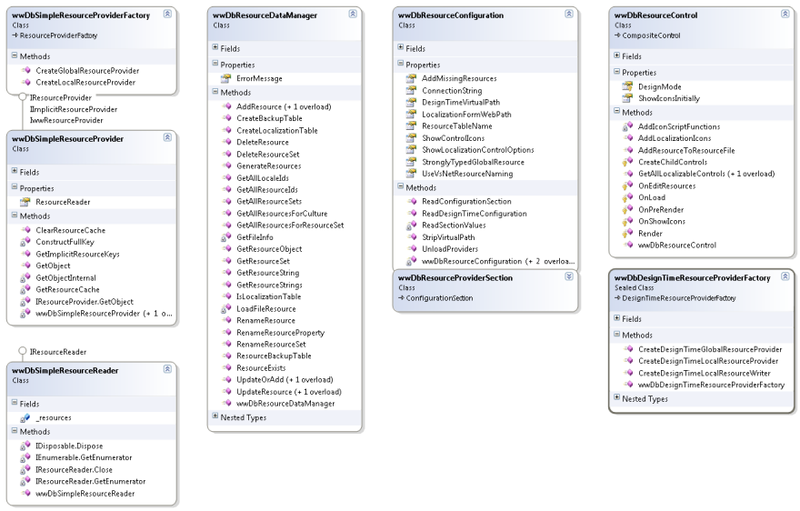 I showed an over simplified view of the ResourceProvider classes that leaves out all of the support classes. Figure 6 shows a more complete model of the simple provider implementation. 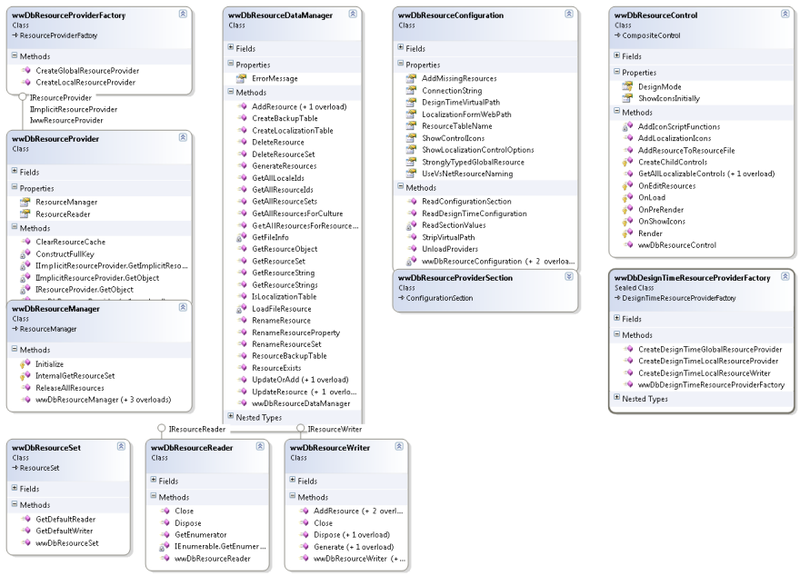 This is the ‘business object’ class that’s responsible for actually managing data access to the resource table. This class is quite extensive and it includes many methods that have nothing to do with the resource provider. The resource provider only requires a single method on the data manager which is GetResourceSet(). But the data manager also provides data interface for the ASP.NET front end editor which accounts for the rich method interface. There are methods for adding, updating, renaming and deleting of resources in a variety of ways, and various methods that return the resource data in various different views required for the resource admin form to work. The class uses an internal wwSqlDataAccess DAL component that is specific to Sql Server. In order for the provider to work properly a number of configuration settings are required. An instance of this class is always available via the static DbResourceConfiguration.Current. There’s the ConnectionString, the table name, and a few other options that are vitally important for the operation of the runtime and design time resource provider. The static instance is accessible from anywhere within the application. For example, DbResourceConfiguration.Current.ConnectionString can be used from anywhere where the connection string is required. It’s used by the Provider implementation, by the data manager and throughout the utility classes. DbResourceConfiguration also holds a reference to all of the provider instances loaded and its static UnloadProviders() method can be called to clear all resources so you can see changes in real time in the application. The provider section provides a .config section for the configuration values exposed by DbResourceConfiguration. The provider section basically duplicates the DbResourceConfiguration properties. When DbResourceConfiguration initializes it reads the configuration section values and loads itself up with these values. As if all these resource providers weren’t enough, Visual Studio requires yet another provider implementation to support design time resource loading and support for the Generate Local Resources feature. The design time resource provider is hooked up to the full resource provider via an attribute. This provider needs to deal with a few design time specific issues like properly retrieving the configuration information (which is very different than a live application) and mapping the virtual directory path of the application. In addition, there’s also some specialty code in this provider that allows for generating simpler ResourceKey ids than the nasty ones Visual Studio generates (lblNameResource1 for example). There’s an optional configuration key – useVsNetResourceNaming which is set to false by default – which effects how resource names are generated. This provider tries to generate simple resource key names (lblName first, then lblName2, lblName3 if there are duplicate control names on a page) which makes it much easier to find resources effectively in the administration interface. This WebControl can be dropped onto any ASP.NET page to provide resource lookup links to popup the resource admin form. The control (shown in Figure 3 as the yellow box) provides a small UI that can be used to toggle the icon drawing on and off. When the control is on a form and enabled, it parses through all of the controls on the live page and looks for localizable properties (those that have a [Localizable(true)] attribute). Any control it finds it then marks with an icon and a link that brings up the administration form. It uses control.TemplateControl.AppRelativeVirtualPath to determine the ResourceSet (ie. Page or control) that it is associated so that controls on user controls or master pages bring up the appropriate user control or master page resources rather than the page’s. The control can be globally toggled off via the showLocalizationOptions provider configuration key. When false the control simply will not render at all on any page. 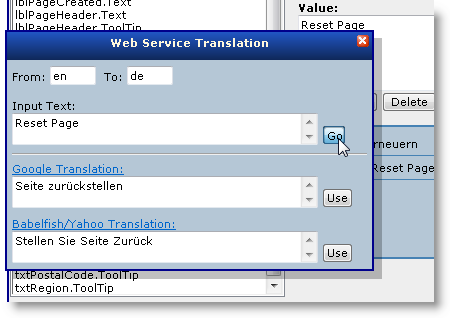 This is great for enabling localization globally without interfering when the site is deployed for a live environment. All of these classes are provided in the accompanying source code so you can take a closer look at each of these implementations. As mentioned earlier I’ve also provided a full ResourceManager implementation and another ResourceProvider that uses the ResourceManager behind the scenes. The DbResourceManager implementation is quite important because it allows the same data based resources to be used in non-Web applications and this is a way to let you test the ResourceManager through your Web interface. Implementing a ResourceManager is a bit more complicated and low level than a ResourceProvider and Figure 7 shows the implementation of this more complex scenario. Figure 7 – A full blown ResourceProvider implementation that uses a data driven ResourceManager to provide all of its data. The ResourceManager is useful because it- unlike the ResourceProvider - can be used in non-Web applications. Functionally the only difference in this chart is the addition of the ResourceManager, ResourceSet, ResourceReader and ResourceWriter classes which serve as the underlying mechanism that talks to the DbResourceDataManager. In this scenario, rather than the ResourceProvider directly interfacing with the data manager all resource retrieval goes through the resource manager implementation instead. Because the resource manager interfaces are quite similar for the ResourceReader and ResourceSet many of the methods in the provider simply forward to the resource manager. As with the ResourceProvider the ResourceManager implementation is mostly boilerplate with just a couple of places where custom behavior is added but it’s not quite as easy as with the provider. There’s no official API for extending .NET resource managers – there are no interfaces to implement, but rather you have to directly inherit from the concrete class and explicitly override various methods. There are no official guidelines on what you need to implement and override and most of the implementation code was gleamed from Reflector and various resources I found online and in the excellent .NET Internationalization book by Guy Smith Ferrier. It’s not an exact science <s>. However, once you have an implementation that works, it can be easily adjusted to work with any kind of data source for resources. The code for the ResourceManager is also provided in the code download. The library also includes a number of other utility classes and tools that you might find useful. There’s a DbResxConverter class which provides a programmatic interface to importing resources from Resx files into the database and the reverse that can export resources back out into Resx files from the database. These options are also available on the ASP.NET Administration interface. There’s also a StronglyTypedWebResources class which can generate strongly typed resources for your Global resources. Although ASP.NET provides strongly typed resources natively (it generates a Resources namespace with each of your global resource sets exposed as classes) its implementation uses a ResourceManager, not the ASP.NET ResourceProvider. This causes two problems: It won’t work with a different resource provider because the ResourceManager is hardwired to Resx resources. It also causes resources to be duplicated in memory as ResourceManager basically ends up creating a separate ResourceManger in addition to the ResourceProvider which results in duplicate resources getting loaded into memory. The generator provided in LocalizationAdmin/StronglyTypedResources.aspx will generate strongly typed resources that properly use the HttpContext.GetGlobalResourceObject() methods to retrieved resources. You can also use the StronglyTypedWebResources class to generate resources in code with a variety of options. will be useful to a few of you and make it a bit easier to create localized applications. I realize that professional localization folks will probably find this tool quaint but for those that are working through localization without high end professionals it should be a great start in helping to localize an application. If you have any questions comments or ideas please stop by our message board and leave a message. 3/31/2009 - There have been a number of updates to the code described in this article. The classes have been refactored and the administration interface has been overhauled to be more responsive. All of the 'ww' classes have been renamed without the 'ww' prefix. There have also been many improvements and small fixes to user provided issues and suggestions that have been integrated. The code base has been integrated into the West Wind Web Toolkit for ASP.NET which consolidates a host of components and tools that have been described in articles and blog posts. This toolset also provides frequent updates and access to the live code repository so that code updates can be disseminated more easily. If you are interested in updates or newer features please check out the code from the toolkit - it includes these same samples described here.